The Wheeltapper Pub and Patio at the Fitzpatrick Grand Central offers a unique event spaces that serve as the perfect gathering place for a special event or party. Our intimate venues and attentive, personal service add a special touch to each event. 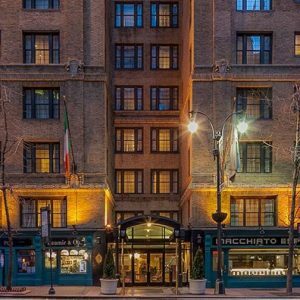 Choose from our event spaces and unique bars and restaurants located in Midtown Manhattan and start planning today! LIAM NEESON PENTHOUSE SUITE – The Penthouse, located on the top floor of the hotel, offers a unique and elegant option for more intimate social events. Able to accommodate 50 guests indoors, the Penthouse also features a large terrace deck that allows you to host up to 50 guests at your function in the middle of the New York City skyline, weather permitting. 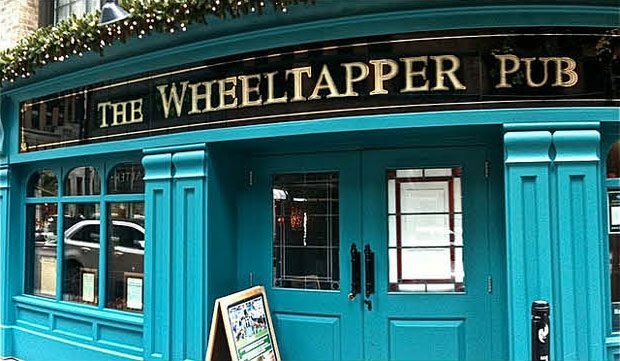 THE WHEELTAPPER – The Wheeltapper Pub can accommodate social functions for up to 65 people in a warm, comfortable atmosphere, and is suitable for cocktail receptions and breakfast, lunch dinner, or brunch functions. THE WHEELTAPPER PATIO – Located off the Wheeltapper Pub, the Patio offers a truly special option for social functions of up to 90 people. Our 2,200 square foot outdoor space is protected by a fully retractable awning and is equipped with gas heaters, so it can be enjoyed in all but the worst weather. Suitable for cocktail receptions and breakfast, lunch, dinner or brunch events, the Patio is a flexible space that offers some unique function options, from a barbecue, to a wedding rehearsal dinner, to a clambake. The Patio is also equipped with large screen televisions for the enjoyment of sports and other viewing events. The Fitzpatrick Grand Central offers several options for your next meeting or special event: Our Boardroom is a comfortable meeting venue accommodating up to 18 people. French doors open to the Patio, making this the perfect space for outdoor breaks and lunches. The Wheeltapper Patio provides a unique option for outdoor cocktail receptions or as a unique lunch space for meetings in the Boardroom. The Patio can accommodate up to 90 people for a stand-up reception. Equipped with gas heaters and a retractable awning, the Patio can be booked confidently for outdoor events year-round in all but the very worst weather. The Liam Neeson Penthouse Suite, located on the 10th floor, features a large patio that puts your event in the middle of the New York skyline. It is a unique option for small meetings, luncheons or dinners for up to 8 people, or cocktail receptions for up to 50 people. The Wheeltapper celebrates the best of a traditional Irish pub, offering contemporary food and drink in an informal atmosphere. 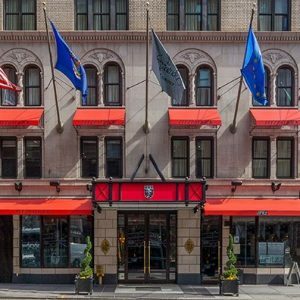 Together with the year-round outdoor Patio, this restaurant and bar is the perfect spot for breakfast before a day of sightseeing, a quick lunch, or relaxing over dinner or drinks after a long day. Open from 7am to 2am daily (the Patio closing at 11pm), The Wheeltapper and Patio offers breakfast, lunch and dinner as well as a bar menu for a lighter snack.